A Reverse Sandwich Contract is a contract that is ridiculously readable, lovely to look at, simple to use, fast to negotiate, & easy to automate. If your business documents aren't optimised for electronic signatures & automation processes, your company will be left behind. If you want to do more with less, you need to increase your productivity. 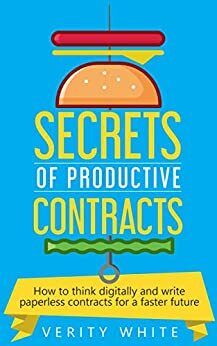 This book will help you increase your productivity & get your contracts working for you, not against you. It's hard to write a contract (even a simple contract!) from scratch. Online templates can be ugly, confusing & expensive. 'Secrets to Productive Contracts' is supported by easy to follow, simple templates & legal visuals. In 'The Future of the Professions: How Technology Will Transform the Work of Human Experts', authors Richard Susskind and Daniel Susskind talk about how the future will look for professionals, including lawyers. This book aims to help legal professionals survive the changes predicted by Richard & Daniel Susskind. Anyone who interacts with contract processes or documents & thinks ‘There has to be a better way! ?’ can get value out of this book. For free legal templates & other productivity tools & resources, head to www.checklistlegal.com/productive-contracts. 5.0 out of 5 starsInsightful; Practical; Hilarious. A great read, full of practical ideas and insights to improve contracts to better suit the needs of legal teams and the contract users. The author's use of wit and humor to makes this an enjoyable book for anyone that touches a contract. Wow! Instant 5 Stars and on the top of my read again list! 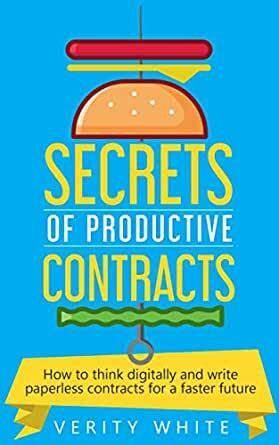 Verity was kind enough to provide me with an advanced copy of Secrets of Productive Contracts and I was not disappointed! Having worked in Defence industry within Capability, Acquisition, and Sustainment Group (CASG) I’ve found myself on the wrong end of some very labour intensive and poorly constructed contracts that aren’t worth the paper they’re written on. This gem of a book was a quick read and provided a myriad of insights in simple to understand terms and analogies that all can understand. I was particularly fond of ‘Reverse Sandwich Contracting’ and admit that I’ve already used it in several improvement focused meetings to great effect. The ‘Easy Wins’ resource towards the books end provides several fast and effective changes that are a great way to gain credibility when entering a new organisation or taking on the management of a new contract. Kudos Verity, I look forward to the next version/edition/revision. Verity's book is highly entertaining but also filled with really practical and helpful suggestions. The concepts outlined in her book are easy to understand and she makes it sound easy to implement them too. I enjoyed reading this book, and look forward to being able to put the secrets into practice! Very pleased with my purchase.